For those of you who caught my product review on Burt’s Bees Grapefruit and Sugar Beet Shampoo and Conditioner, you know I’ve been in a bit of a hair care conundrum. In response to the lousy experience I had with that particular product, I went out and purchased Nature’s Gate Organics Lavender and Aloe Shampoo and Conditioner. I’ve now been using this shampoo for about a month. My hair was a mess after the Burt’s Bees experience (I lovelovelove Burt’s Bees, but their Grapefruit and Sugar Beet line really gunked up my hair…). It was oily and there was tons of buildup on my scalp from the conditioner. It wasn’t looking good. So, I really hoping that the Nature’s Gate Organics would bring things back to normal. And, it has. First, my hair feels really clean with this shampoo. You don’t need a lot to work up a decent lather, and it rinses away very clean. The conditioner is perfect. I have very thick, curly hair, so usually I have to gunk on the conditioner just to get my comb through in order to brush the tangles out. Not with this conditioner; one quarter-sized dollop is all I need. It also rinses clean and leaves no gunk on my hair or my scalp. And, my tangles are easily brushed out. 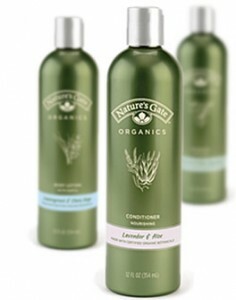 Another huge perk is the scent; both the Nature’s Gate Organics Lavender and Aloe shampoo and conditioner smell divine. Before I bought this new line I checked them out on Skin Deep’s Cosmetic Safety Database. For some reason the shampoo isn’t up there, but the conditioner scored very well (a 1 on a scale of 0-10 for product safety). You can see the full Cosmetic Safety Database write up on the conditioner here. Plus, Nature’s Gate Organics have signed the Compact For Safe Cosmetics, which is their pledge to produce safe products, removing hazardous chemicals and promoting transparency between their company and the consumers who buy their products. So, I figured the shampoo was probably just as safe as the conditioner. I have nothing bad to say about this shampoo and conditioner. I’ve been completely happy with it, and would definitely buy it again. My vote: five out of five stars. After it’s used up, however, I’m thinking about trying a shampoo bar. I love the idea, because shampoo bars are just a bar of soap; there’s no plastic packaging involved, which means less waste and resources consumed. Two brands, Purple Prairie Botanicals, and Soap For Goodness Sake, scored very well on the Cosmetics Safety Database (you can see a listing of the safest shampoos by clicking here). So, I’m thinking of trying one of them. Have you guys ever used a shampoo bar? If so, did you like it? I’ve never used one, and am not even sure I know how. Do you rub it on your head? Lather it up on your fingers and then scrub? Disclaimer: Everything in this product review is 100% my own opinion. This is NOT a paid or sponsored post. There are no paid or sponsored posts on The Greenest Dollar. I’m glad I read your review since I was indecisive on if I should buy this brand, and i think i will take the leap next time. I’ve tried a shampoo bar before and I was apprehensive at first, but it’s really easy. I tried one from Lush and you just wipe on your hair a few times and it suds up your hair and you just wash regularly. However, I didn’t really like how it left my hair so I never tried it again. I would try a shampoo bar again but a different brand.